Gaetano Donizetti, Italian composer, was born on November 29, 1797 in Bergamo, Italy and died on April 8,1848 in Bergamo, Italy. He is known primarily as an Opera composer, writing more than 65 - the most famous: Lucrezia Borgia (1833), Lucia di Lammermoor (1835), La Favorita (1840), La Fille de regiment (Paris, 1840) and Don Pasquale (Paris, 1843). He literally dominated Italian Opera of the Romantic Period in Music (1825-1900) from the death of composer Vincenzo Bellini (1801-1835) until the success of Giuseppe Verdi’s (1813-1901) Opera Nabucco (1842). In addition to a many operatic and sacred choral works, he wrote a large number of orchestral and instrumental compositions, many in a single day, at one sitting. 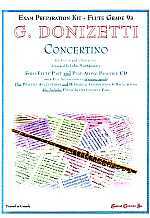 Concertino (a small Concerto) is based on a Sonata for Flute and Piano (composed May 15,1819) - the autograph manuscript is in the Donizetti Museum in Bergamo.